Palm Sunday has all the thrill and excitement of a triumphant, victory parade such as Roman citizens were used to throwing for their conquering Caesar upon his return from a successful military campaign. This is what the enthusiastic crowd of supporters thought this was all about – hoped that this was all about. BUT THIS IS NOT WHAT THIS IS. We all want someone to ride into town and be our conquering hero. We’re ready whatever candidate we think can demonstrate that he’s got what it takes to do what we think ought to be done to make THIS WORLD a better place. Alright, THIS NATION a better nation. Alright, MY LIFE a better life. But the rest thought Jesus was their man. They had either seen the incredible things He had done or had heard about them. He healed the sick and gave sight to the blind and cast out demons. He even raised the dead. Or at least that’s what I heard. We could use a king like that. “The whole multitude of his disciples began to rejoice and praise God with a loud voice for all the mighty works they had seen, saying, ‘Blessed is the King who comes in the name of the Lord!’” It’s all pretty heady stuff. But if we were to look at this from ANOTHER VIEWPOINT, the viewpoint of the One on the donkey, it would look and sound altogether different, wouldn’t it? 	Four days until one of His inner circle betrays Him. 	Five until He is the lowest servant and washes their feet. 	Six days until He is arrested, mocked, spit on, flogged to the bone, and crucified. And He knows all of this as sees the exuberance of the crowds, and hears their singing. 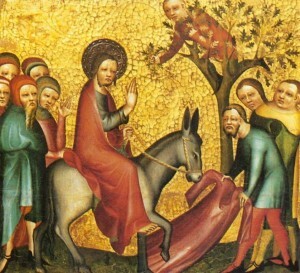 But for Him, Palm Sunday is not so much a victory parade as it is a death march. Every visit that Jesus had made to Jerusalem before was always with this visit in mind. He had come to the city with His parents for the Passover every year while He was a child. And when He was only 12 years old the Rabbi’s were amazed at His wisdom. He celebrated the Passover in Jerusalem every year with His disciples over the traditional Seder meal that was filled with singing and joy and laughter and always the eating of a lamb and unleavened bread and drinking cups of wine. There’s lot’s a happy memories for Him in Jerusalem. Lot’s of good times there. So why, as He comes around a bend in the road and a view of the city suddenly opens, does He break down in tears of sorrow and sadness? BECAUSE THEY DON’T GET IT. They thought is was all about power and politics and economics and military strength and ‘adjusted gross income’, and religion, and … well, you fill in the blank. What do you think the future depends on? With tear-filled eyes, He responds to the cheering crowds, “Would that you, even you, had known on this day the things that make for peace!” Those are words of DEEP REGRET. It could have been SO much different. It could have been SO much better. BUT THEY DIDN’T GET IT. They didn’t get that the things that makes for peace ARE NOT ‘THINGS’, but a person. Jesus Christ is your peace. “Peace I leave with you. My peace I give you. NOT AS THE WORLD GIVES DO I GIVE TO YOU.” (John 14:27). But they only thought about peace the way the world promises to give it – if we just get the right politics, the right economics, the military strategy, the right religion, the right… you fill in the blank. But it’s never RIGHT. Longing for peace – but never finding it, never having it – even as the PRINCE OF PEACE is right there, and they are cheering Him on. But they don’t get it. He will not meet their expectations. He will disappoint them – and deeply so. He will prove Himself to be so weak and naïve – pathetic really. Ah, but now we’ve switched back to the viewpoint of the crowd again. This is the way it all appeared to them. But if we will see this from His viewpoint, we see it altogether differently. He comes to give His peace to all who will have HIS PEACE – which is the only REAL peace there is. But He comes to give you peace – not as the world gives it – but as He gives it. And His ways for PEACE are foolish and weak and require self-denial and sacrifice and suffering and even death – even death on a cross. Not because it HAD to be this way. It could have been so much different. It could have been so much better. If we would have only LISTENED TO HIM, and BELIEVIED HIM, AND TRUSTED HIM AT HIS WORD, it wouldn’t have required this death march. But we didn’t listen to Him did we? We only heard what we wanted to hear. And we didn’t believe Him or trust Him at His word, did we? We only believe Him insofar as we agree with Him and trust Him insofar as it is convenient for us. And now there is something that stands like a between us and His peace. And that something is our sin. Before there can be peace – real peace – PEACE WITH GOD, PEACE WITH ONE ANOTHER, PEACE WITH OURSELVES, that barrier that we have built has to be dealt with. Atonement must be made for all of our sins – our sins against God, our sins against others, our sins against ourselves – and the barrier removed. And this is what Jesus is riding into Jerusalem to do. He atones for them all by taking them all upon Himself and suffering the punishment that they deserve – in full. And so Jesus rides into Jerusalem to die. It’s a death march. He rides on, rides on, in lowly pomp, to die. He rides on to lay down His life for every sin and every sinner from the first man Adam to the last man alive when He comes again. And only He can atone for them because only He is worthy. 	For all of our attempts to secure a peace for ourselves AS THE WORLD GIVE PEACE, which means, ‘peace for me’ no matter the hell it causes you – He’s worthy to take it all away, that we may not have hell but may have HIS PEACE. 	For all the nasty things that go on behind closed doors and in closed minds that create victims and leave scars – He is worthy to take it all away, that we may be not remain captives but be free and healed and have HIS PEACE. 	For all the grand injustices that make the news and the hidden ones that no one sees but that each leave their tell-tale scars of resentment and anger that we’ve been carrying around in us for God knows how long – He is worthy to take it all away, that we may have HIS PEACE. This is Palm Sunday. Jesus rides into Jerusalem to die. He rides on to go to the cross and bear the awful load that only He can bear. He is worthy because He has no sin. None of this is FOR HIM. It is all FOR YOU. He is betrayed FOR YOU. He is a servant FOR YOU. He is abused and flogged to the bone and crucified FOR YOU. He is weak and lowly and the greatest fool the world has ever known FOR YOU. This entire REASON that He came into the world is the entire REASON He is riding into Jerusalem. It is the Father’s will that the Son should bear the sins of the world and atone for them and reconcile all things in heaven and on earth through His body of flesh – “in order to present you holy and blameless and above reproach before Him.” (Col 1:22). Palm Sunday is a death march that proceeds from the village of Bethany into Jerusalem and from Jerusalem through time and into this very place today. Today, Jesus rides into this sanctuary on the donkey of His Word preached and His Sacraments administered. He rides to us on His Word, and speaks His peace into our ears that by hearing we may GET IT. PEACE BE WITH YOU! He rides to us this morning on the bread and wine and puts His body in our hands and His blood onto our lips, that by eating and drinking we may GET IT. THE PEACE OF THE LORD BE WITH YOU ALWAYS. THIS IS PALM SUNDAY. It’s a death march. BUT IT’S NOT A DEATH MARCH THAT ENDS IN DEATH. It is a march that goes through death and ends with LIFE. And so there is yet another viewpoint that we must see all of this from and it is the view from heaven. Would you take your bible and go to Revelation 19:11-16 – page 1040. The day is surely coming when we will see Palm Sunday in from no other viewpoint than this – AND WE WILL GET IT. Fully, completely, perfectly.